Robert Horne had the most liked content! 1937 Plymouth Rear Springs Settling after rear end swap. I had my 38 Coupe body hanging on the garage rafters for a couple of years... Not very heavy, like one would think. Makes it great for paint work..
No adapter needed. Had the trans front cover shaved to fit the approx. 5 inch hole in bell house. 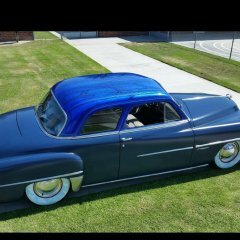 I bought my headliner for my 38 Coupe from Kmart. It is a large blanket. These are two layers sewn together, with the rows about 3 inchs apart. I stretched it a little each day and clamped until it was very tight before attaching it. It still looks great. I did a little research a few years ago. My notes have using my stock Plymouth hub, and a Explore rotor, I think around a 2000 model, $29. I do not know if the front or rear rotor was in my research. I have a diagram of a caliper bracket, to use a Explore caliper also. I never did complete this setup, so I do not know if anything is correct. 89 Dakota looked to be a possible fit also.